Northwest Ohio Urgent Care Provides Immediate Care Near Maumee, OH. Our Doctors Are Ready to Help You Feel Better! For More Information Call Us at (419) 333-8031 or Simply Request an Appointment Online! 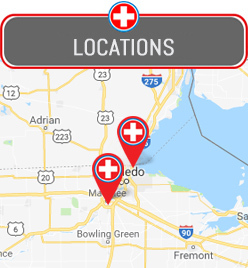 When you need immediate care near you in Maumee, OH skip an expensive, time-consuming trip to the emergency room and visit the board-certified doctors at Northwest Ohio Urgent Care. Our physicians are available six days a week and can treat a variety of non life-threatening illnesses and injuries. Don’t delay treatment for an ailment that could get potentially worse. This delay in treatment could not only prolong your recovery but also make it costlier. We accept most major insurances and treat our patients with the utmost compassion and professionalism. Have you suffered a severe laceration or cut? Immediately visit our urgent care center near you today for sutures, more commonly known as stitches. We will examine your wound, clean it, and then give you sutures so your injury will heal properly. Without them, you risk reopening your wound again, which may lead to an infection. If your laceration is spurting blood, doesn’t stop bleeding after 20 minutes, or has caused the loss of use in a limb, please immediately go to the emergency room as this is likely a life-threatening injury. We can also remove sutures, with no appointment needed. Never ask, “Do you think this is broken?” without getting an immediate answer. Come to our urgent care facility today for immediate access to our digital x-ray. This powerful diagnostic tool allows us to look for dislocations and fractures. If one of these injuries goes undiagnosed, it is unlikely to heal properly, and you are likely to further aggravate it. If an injury isn’t a fracture or dislocation, you could still be suffering from a soft tissue injury like a sprain or a strain. Regardless of what you are suffering from, we will stabilize your injury and give you detailed instructions on how to care for yourself at home. We have all of the needed supplies in stock at our urgent care center to send you home, so you can start to feel better. You will also be sent home with a copy of your x-rays, and we can forward it to your primary care physician upon request. Although we are available for immediate care for illnesses and injuries, we are also here for you when you need an immediate physical. These thorough medical examinations are required commonly as a pre-employment requirement, to start a new school, or to participate in a sport. While these examinations are easy to administer, it can be difficult to schedule them with your primary care provider. Come to our walk-in clinic today and receive a physical with no appointment needed. Simply bring in the forms, and we’ll fill out all paperwork after your exam. Northwest Ohio Urgent Care is located at 1015 Conant St Maumee, OH 43537. We are open Mon – Fri: 8am – 8pm, Sat: 9am – 5pm. We are closed on sundays. Our immediate care clinic accepts most major insurances, and we have self-pay options available for the uninsured. Questions about our services or would you like to make an appointment? Call our friendly staff today at (419) 333-8031. We look forward to serving you!